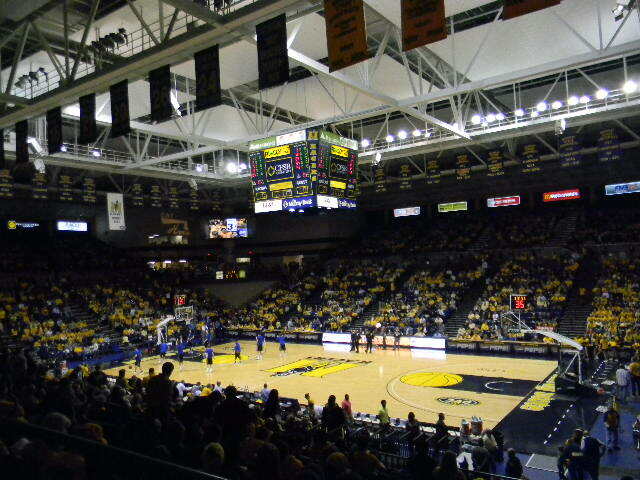 The CFSB Center also known as "The Bank" sits at the north end of Murray State's campus. The open concourse arena sits 8,600 Racer faithful and made its debut in 1998. It's a multi-purpose facility hosting concerts, university events, and more. The arena has two levels with a concourse serving both levels. The concourse floor is an indoor track. The concourse has four concession stands at each corner of the arena. You can locate the concession stands by looking for "Eat Here" on the walls. There are also several vendors on the concourse. The lower level seating in sections 117-121 and sections 106-110 are chairback seats. Sections 112-115 have bleacher seating. This section sits the student section and the band. 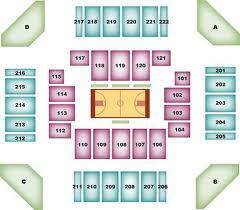 Section 101-104 is across the way from the students and have bleacher seating as well. The 200 level seating are all bleacher seats. There are four separate seating sections. Each section goes has 19 rows. In the rafters you can find several retired numbers, OVC team banners, and many conference and NCAA tournament banners. The drop down scoreboard provides you with player numbers, fouls, and points scored. It all features scoreboard basics such as score, time, and team fouls. 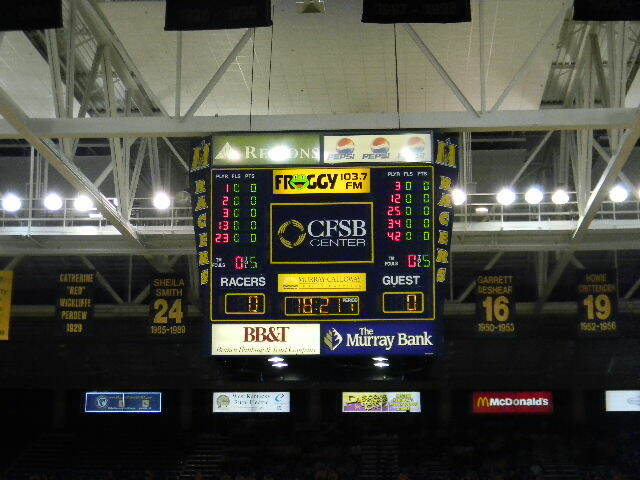 The CFSB Center has two video boards located in front of entrances B and D.
The floor has the Murray State logo is center court with the word Racers below. The free throw lane is blue. Normally you just see a half circle in the free throw lane, but at the CFSB center you have a full circle which is yellow. The baselines include the words Murray State in yellow with a blue backdrop. The exterior of the building has red brick with the CFSB logo. Racer Arena-Home of the Racer Volleyball team. #1 Find a place to eat before the game. Several Racer fans suggested Big Apple Cafe, Matt B's (pizza), and Tom's Pizza. #2 You can find parking by the football stadium. Parking is free which is always nice. 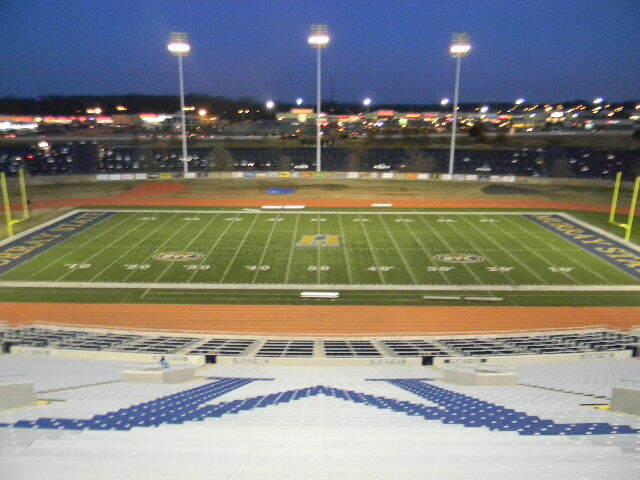 Take a look at the football stadium while you're in the area. #3 Take a walk around Murray State's campus. A few things you must see before you leave. 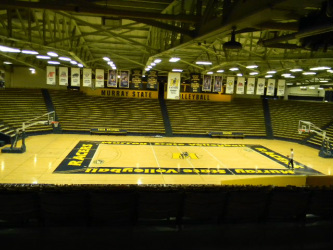 Racer Arena, now home to the Racers Volleyball team is the old home of Racers Basketball. 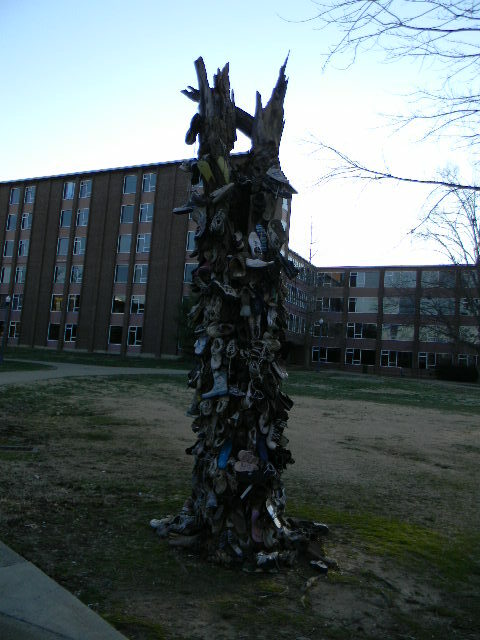 The "Shoe Tree" located by the Pogue Library on the South side of campus. #4 Head back towards the CFSB Center. The new practice facility is located at the North end of the building. You don't often see practice facilities at the Mid Major level, so check it out. #5 Head to "The Bank" and have fun! CFSB Center: This is a great place to watch a basketball game. Great views of the action from anywhere in the arena. Open concourse keeps you engaged in the game while waiting in line or walking to the restroom. The concourse floor was different with it being a track, but it doesn't kill the vibe in the building. Loved all the banners in the rafters, showed off the rich history of the program. The scoreboard provided the basics. The video boards were a great addition and are nice for the fans. I like chairback seating throughout, but the bleacher seating wasn't an eye sore since they are blue. The outside of the building was fine, liked the color of brick. I would like to see a few suites in the arena, but I'm not 100 percent on where I would put them. I liked the LED banner in front of the scorers table. Murray State University Campus: I walked the Murray campus in about an hour and half. The campus is 236-acres. A few things stood out to me on the walk. One of my favorite buildings on campus is the Jesse D. Jones Hall. The building was completed in 2009 and brings a fresh look to the campus. On the South side of campus is the Pogue Library. The library was finished in 1931 and they have gold doors. Outside of the Pogue Library you will see the Rainey T. Wells statue, the founder of Murray State University. Right next to the statue sits the "Shoe Tree". The tree is covered with shoes of couples that go to Murray. For more info on the tree, click here. 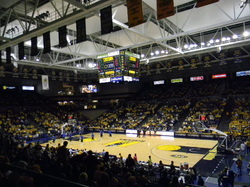 Located in the center of campus is Racer Arena. If you love old arenas this is your place. It's now the home of Racers Volleyball and is the largest volleyball only arena in the country. On the North end of the campus you'll find Roy Stewart Stadium, Reagan Field and the CFSB Center. I liked how all the sports facilities were in the same area. The softball field should be completed this spring. 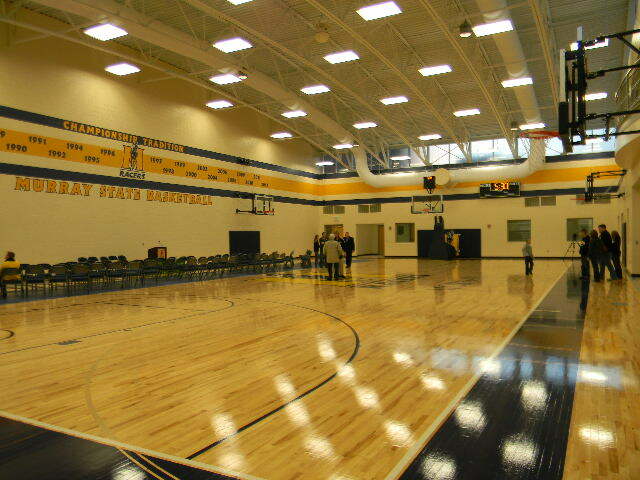 The newest addition to the Murray State campus is the basketball practice facility. You don't often see practice facilities at the mid-major level and it's the first one in the OVC. It includes one practice gym and several offices for the men and women's basketball teams. Thanks to Tom Via of OVCBall.net for showing me around. Murray, Kentucky: Murray, KY is a city of about 18,000 people that sits in Western Kentucky. Murray State's the focal point of the town. To the East of Murray is the Land Between the Lakes. Atmosphere: The students arrived early and were active the whole night. The Racer fan base got to their feet many times throughout the game. I like when I see a fan base rise to their feet, it shows they are engaged in the game. It was also nice to see a decent crowd 20 minutes before tip-off. Overall Racer Nation provides a great atmosphere inside the CFSB Center. Court Design: I liked the court design. The court had a classic look, no over powering designs. Nice Job.